Need a snack? Don’t feel guilty! 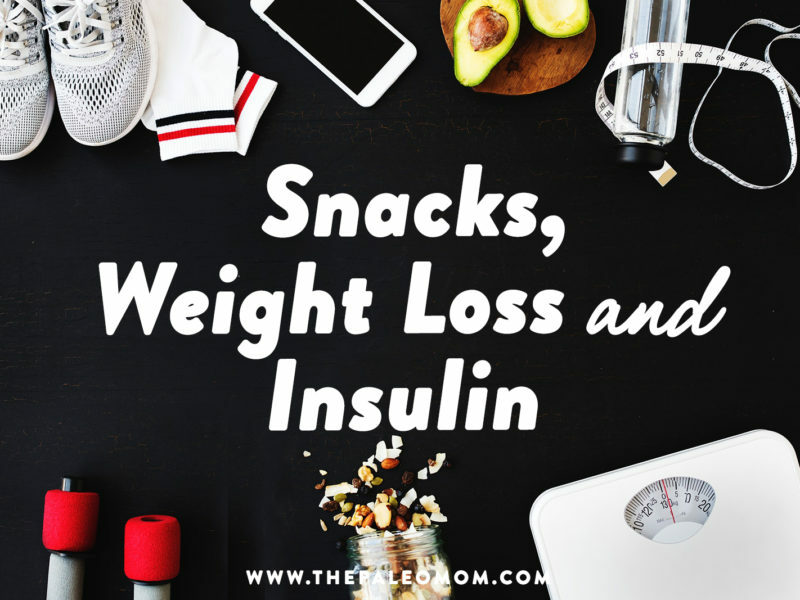 Read on to learn what the best snack choice is from a metabolic perspective. 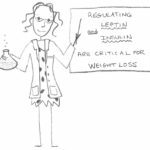 If you’re looking to restore or protect insulin sensitivity and to achieve a healthy weight, then you’re likely confused by all the contradictory information out there about how many meals a day to eat and when to eat them. 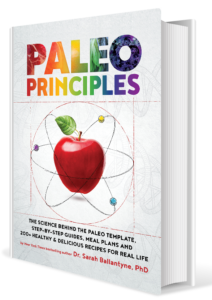 I’ve written A TON about keys to successful weight loss, insulin sensitivity, and macronutrients, so before I dig into this topic, I recommend that you also read: Paleo for Weight Loss, Healthy Weight Loss with Paleo, Part 1: Modifying Dietary Choices to Support Fat Metabolism, Healthy Weight Loss with Paleo, Part 2: Lifestyle Choices That Make a Difference, Healthy Weight Loss with Paleo, Part 3: Troubleshooting Weight Loss Difficulties, Healthy Weight Loss with Paleo, Part 4: Using the Obesity Paradox to Inform Our Goals, New Scientific Study: Calories Matter, Portion Control: The Weight Loss Magic Bullet, 10 Nutrients that Can Help You Burn Fat, The Case for More Carbs: Insulin’s Non-Metabolic Roles in the Human Body, How Many Carbs Should We Eat?, 3 Ways to Regulate Insulin that Have Nothing to Do With Food, The Hormones of Fat: Leptin and Insulin, Carbs Vs. Protein Vs. Fat: Insight from Hunter-Gatherers, The Diet We’re Meant to Eat, Part 1: Evolution & Hunter-Gatherers, The Diet We’re Meant to Eat, Part 2: Physiological & Biological Evidence, and The Diet We’re Meant to Eat, Part 3: How Much Meat versus Veggies?. Phew! 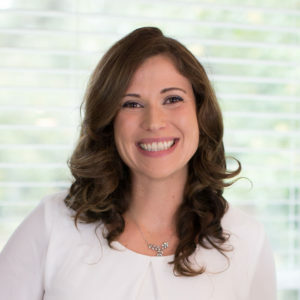 And, if you’re looking for more information on healthy weight loss, I also recommend that you check out ThePaleoMom Workshop & Masterclass 2019 as these topics featured heavily in the program sessions (along with lots of weight loss myth busting). 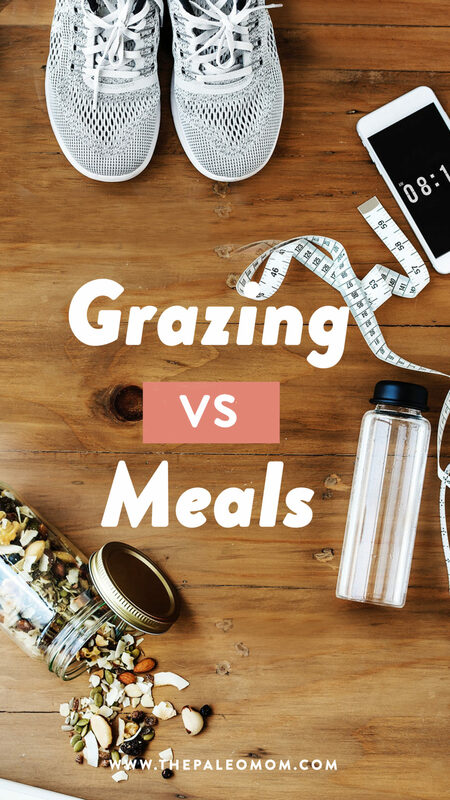 In order to discuss the role of snacks in weight management and metabolism, we need to first discuss the research on grazing and intermittent fasting for weight loss and insulin sensitivity. Pop culture wisdom may tell you that eating 6 to 8 small meals daily will help you lose weight, but studies don’t bear this out. Recent, well-controlled prospective studies in overweight or obese individuals have shown that increasing meal frequency provides no significant benefit to glucose regulation, insulin sensitivity, lipid profile or weight loss success provided the diet overall is well-structured to support weight loss (see Paleo for Weight Loss). And, while increasing meal frequency may help protect against loss of lean muscle mass during weight loss, the effect is much smaller than the preservation of lean muscle mass afforded by eating a higher protein diet (say 30% calories from protein) during weight loss and by exercising—especially strength training—during weight loss. Collectively, these studies show us that there’s a benefit to eating breakfast (especially one that includes quality protein), and that eating something like 3 meals a day is probably optimal. 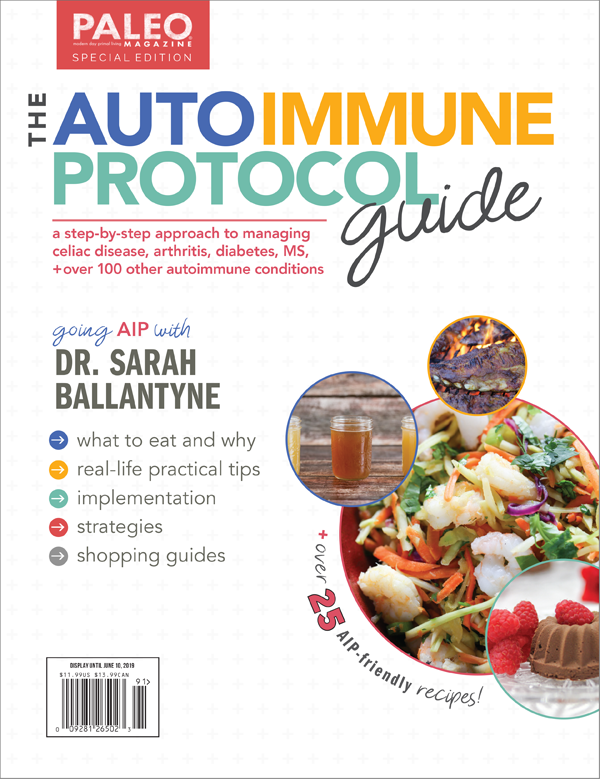 But most importantly, the overall quality of the diet, total caloric intake, and lifestyle factors are much, much, much bigger influencers of weight, insulin sensitivity and metabolic health than how many time per day you eat and when. 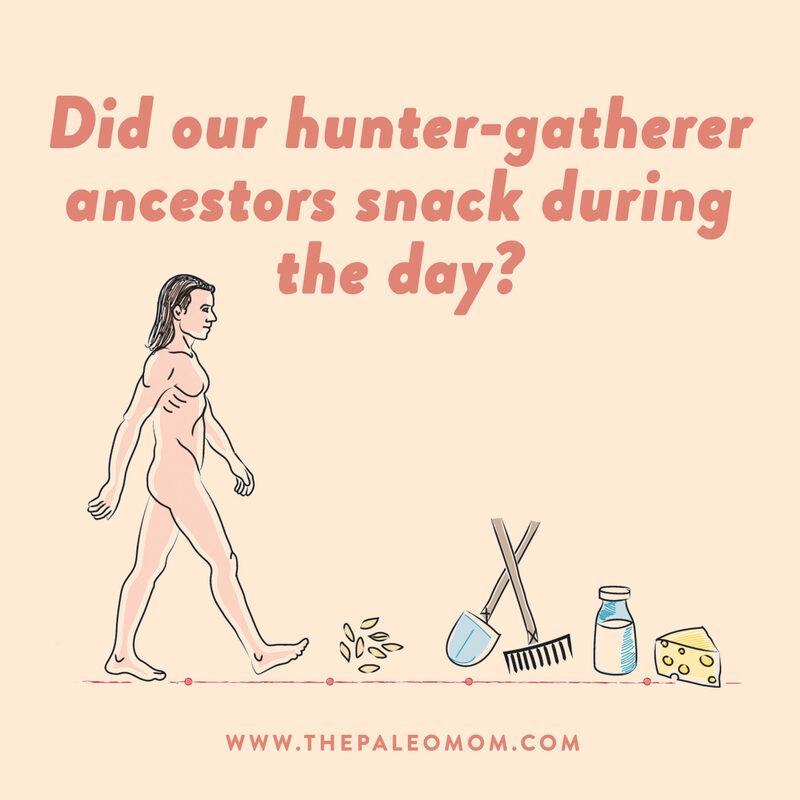 Did our hunter-gatherer ancestors snack during the day? The social construct of “the meal” was something that came with the advent of agriculture. Prior to this, food was eaten shortly after it was hunted or gathered, adding stochasticity to food intake, varying day-to-day, and generally more frequent in times of feast, less frequent in times of famine. Also, women and children were more likely to “snack”, eating some foraged food as they were gathered. This may have helped to promote growth in children and fertility in women. “The view of the hunter-gatherer as a central place forager does not discount the likelihood that some fraction of foraged food was eaten at the time it was encountered (viz, snacking). This might have been especially true in children who were included in gathering from an early age—and some amount of snacking was likely to have been tolerated. The much more recent advent of agrarian societies has probably sharpened the rules of meal structure. The critical aspect of this argument is that meals are NOT an intrinsic biological property of H. sapiens, but are instead are a product of social and economic imperatives.” Rowland NE. Behav Brain Res. 2012 Jun 1;231(2):272-8. So, we can stop demonizing snacks as somehow contrary to hunter-gatherer behavior. But, just because hunter-gatherers did it, doesn’t automatically mean it’s good for us. So, what does contemporary science actually tell us about the pros and cons of snacking? Studies are finally evaluating snack quality in addition to snacking behavior, and it turns out that this is of vital importance in determining whether there is a benefit or detriment to snacking. In terms of behavior, “snacking” has a completely ambiguous impact on weight and health, with some studies showing that snacking helps maintain a healthy weight, others showing that snacking causes weight gain, some studies showing that snacking is associated with poor diet quality and yet others showing that snacking is associated with high diet quality. Just as choosing whole foods, lots of vegetables and fruit, quality proteins, and striving for nutrient sufficiency are essential for a health promoting diet as a whole, the same can be said of individual meals and snacks (see also The Importance of Vegetables and The Importance of Nutrient Density). Whether or not you snack is not a determinant of weight loss success or of health; instead, it matters what you snack on! So, provided you’re choosing healthy foods to snack on, there’s absolutely no detriment to snacking itself. 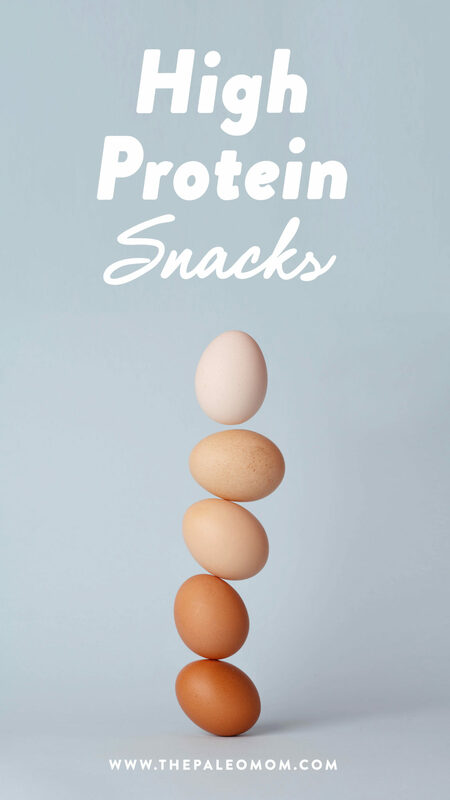 And, in terms of weight loss, there may even be a benefit, provided you’re eating the right snack… which brings me to the benefits of a high-protein snack! A few studies have demonstrated the benefits of choosing a high-protein snack on weight and insulin sensitivity. A recent study of healthy women concluded that, compared to high-fat or high-carb snacks, eating high-protein snacks, even if lower in calories, improved appetite control, satiety, and reduced food intake at subsequent meals. A similar effect was seen in a separate study of healthy men (interestingly in this study, fiber-enriched snacks did not show the same reduction in subsequent food intake). Another study in type 2 diabetics showed that high-protein snacks results in fat mass loss, despite no change in total energy intake. And yet another study in healthy women showed that a high protein, high fiber snack not only reduced energy intake at the next meal but also reduced glucose and insulin responses over the whole day. Finally, in a primate study, a high-protein, high-fat snack improved glucose regulation and maintained insulin sensitivity (the controls that did not receive a snack progressed toward higher insulin during the study). Taken together, these studies make a compelling case for choosing snack foods that include high quality protein. This seems like a great opportunity to mention my new favorite high-protein snack: Chomps jerky sticks. Sure Chomps has been around for a long time, but it’s their two new AIP flavors (Italian Style and Sea Salt Beef) that have me hooked! All of their jerky sticks are made with 100% grass-fed and grass-finished beef or venison, or 100% free-range antibiotic free turkey, contain 9-10 grams of protein per stick, and are free of all the icky things: added sugar, GMOs, gluten, dairy, soy, artificial preservatives or colorings, binders, fillers, MSG, nitrates/nitrites (except those naturally occurring in celery), etc. Better yet, Chomps has graciously offered my readers a 20% discount code! 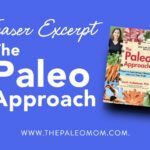 Simply use the code THEPALEOMOM at checkout! Alencar MK, Beam JR, McCormick JJ, White AC, Salgado RM, Kravitz LR, Mermier CM, Gibson AL, Conn CA, Kolkmeyer D, Ferraro RT, Kerksick CM. Increased meal frequency attenuates fat-free mass losses and some markers of health status with a portion-controlled weight loss diet. Nutr Res. 2015 May;35(5):375-83. doi: 10.1016/j.nutres.2015.03.003. Bellisle F. Meals and snacking, diet quality and energy balance. Physiol Behav. 2014 Jul;134:38-43. doi: 10.1016/j.physbeh.2014.03.010. Carlson O, Martin B, Stote KS, Golden E, Maudsley S, Najjar SS, Ferrucci L, Ingram DK, Longo DL, Rumpler WV, Baer DJ, Egan J, Mattson MP. Impact of reduced meal frequency without caloric restriction on glucose regulation in healthy, normal-weight middle-aged men and women. Metabolism. 2007 Dec;56(12):1729-34. Chapelot D. The role of snacking in energy balance: a biobehavioral approach. J Nutr. 2011 Jan;141(1):158-62. doi: 10.3945/jn.109.114330. Chowdhury EA, Richardson JD, Holman GD, Tsintzas K, Thompson D, Betts JA. The causal role of breakfast in energy balance and health: a randomized controlled trial in obese adults. Am J Clin Nutr. 2016 Mar;103(3):747-56. doi: 10.3945/ajcn.115.122044. Dixit VD, Yang H, Sayeed KS, Stote KS, Rumpler WV, Baer DJ, Longo DL, Mattson MP, Taub DD. Controlled meal frequency without caloric restriction alters peripheral blood mononuclear cell cytokine production. J Inflamm (Lond). 2011 Mar 7;8:6. doi: 10.1186/1476-9255-8-6. Doyon CY, Tremblay A, Rioux LE, Rhéaume C, Cianflone K, Poursharifi P, Turgeon SL. Acute effects of protein composition and fibre enrichment of yogurt consumed as snacks on appetite sensations and subsequent ad libitum energy intake in healthy men. Appl Physiol Nutr Metab. 2015 Oct;40(10):980-9. doi: 10.1139/apnm-2014-0403. Hampl JS, Heaton CL, Taylor CA. Snacking patterns influence energy and nutrient intakes but not body mass index. J Hum Nutr Diet. 2003 Feb;16(1):3-11. Hess JM, Jonnalagadda SS, Slavin JL. What Is a Snack, Why Do We Snack, and How Can We Choose Better Snacks? A Review of the Definitions of Snacking, Motivations to Snack, Contributions to Dietary Intake, and Recommendations for Improvement. Adv Nutr. 2016 May 16;7(3):466-75. doi: 10.3945/an.115.009571. Kulovitz MG, Kravitz LR, Mermier C, Gibson AL, Conn CA, Kolkmeyer D, Kerksick CM. Potential role of meal frequency as a strategy for weight loss and health in overweight or obese adults. Nutrition. 2014 Apr;30(4):386-92. doi: 10.1016/j.nut.2013.08.009. Epub 2013 Nov 20. Mettler S, Mitchell N, Tipton KD. Increased protein intake reduces lean body mass loss during weight loss in athletes. Med Sci Sports Exerc. 2010 Feb;42(2):326-37. doi: 10.1249/MSS.0b013e3181b2ef8e. Navas-Carretero S, Abete I, Zulet MA, Martínez JA. Chronologically scheduled snacking with high-protein products within the habitual diet in type-2 diabetes patients leads to a fat mass loss: a longitudinal study. Nutr J. 2011 Jul 14;10:74. doi: 10.1186/1475-2891-10-74. Ortinau LC, Hoertel HA, Douglas SM, Leidy HJ. Effects of high-protein vs. high- fat snacks on appetite control, satiety, and eating initiation in healthy women. Nutr J. 2014 Sep 29;13:97. doi: 10.1186/1475-2891-13-97. Patterson RE, Sears DD. Metabolic Effects of Intermittent Fasting. Annu Rev Nutr. 2017 Aug 21;37:371-393. doi: 10.1146/annurev-nutr-071816-064634. Rowland NE. Order and disorder: temporal organization of eating. Behav Brain Res. 2012 Jun 1;231(2):272-8. doi: 10.1016/j.bbr.2011.11.021. Schoenfeld BJ, Aragon AA, Krieger JW. Effects of meal frequency on weight loss and body composition: a meta-analysis. Nutr Rev. 2015 Feb;73(2):69-82. doi: 10.1093/nutrit/nuu017. Shin D, Song S, Krumhar K, Song WO. Snack patterns are associated with biomarkers of glucose metabolism in US men. Int J Food Sci Nutr. 2015;66(5):595-602. doi: 10.3109/09637486.2015.1064873. Stote KS, Baer DJ, Spears K, Paul DR, Harris GK, Rumpler WV, Strycula P, Najjar SS, Ferrucci L, Ingram DK, Longo DL, Mattson MP. A controlled trial of reduced meal frequency without caloric restriction in healthy, normal-weight, middle-aged adults. Am J Clin Nutr. 2007 Apr;85(4):981-8. Williams G, Noakes M, Keogh J, Foster P, Clifton P. High protein high fibre snack bars reduce food intake and improve short term glucose and insulin profiles compared with high fat snack bars. Asia Pac J Clin Nutr. 2006;15(4):443-50. Yan MR, Parsons A, Whalley GA, Rush EC. Effects of a healthier snack on snacking habits and glycated Hb (HbA1c): a 6-week intervention study. Br J Nutr. 2016 Dec;116(12):2169-2174. doi: 10.1017/S0007114516004372. Yildiran H, Mercanligil SM. 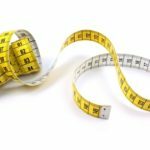 Does increasing meal frequency improve weight loss and some biochemical parameters in overweight/obese females? Nutr Hosp. 2019 Mar 7;36(1):66-72. doi: 10.20960/nh.2191. Ziegler TE, Sosa ME, Peterson LJ, Colman RJ. Using snacks high in fat and protein to improve glucoregulatory function in adolescent male marmosets (Callithrix jacchus). J Am Assoc Lab Anim Sci. 2013 Nov;52(6):756-62.